What to make with ground walnuts…why not grind them into walnut meal and make gluten free chocolate walnut meal cookies! Have you ever ground up nuts to make a nut flour from scratch? I love to do this with nuts like walnuts. Walnut meal adds a nice protein boost to my baking. Our family eats walnuts every day. In our yogurt, cereal, baking, we even take them in a baggie on bike rides for a protein boost. I knew I could put them to good use in making a fun gluten free treat. How do you like to enjoy walnuts? I also love walnuts in this Gluten Free Banana Walnut Chunky Monkey Donut recipe! Walnuts are also delicious in homemade granola like this Cinnamon Granola recipe. I love to use the walnuts to make a gluten free chocolate cookie. Add in walnuts for protein, and it is a match made in heaven. I often use almond flour in my cookie recipes, but today I a going to make my own ground walnuts. If you want to learn how to make your own nut flours, this is a great tutorial. To make a homemade walnut meal, you will need a grinder. My first choice to grind walnuts is a Cusinart Immersion Blender. It has a mini food processor attachment that is the perfect size for grinding nuts. Other ways to grind your nuts into nut meal include a regular food processor or blender. You can buy a special pitcher for Vitamix that is for grinding flour. You can also use a grinder attachment on your Kitchen Aid mixer. I personally love using my new Cuisinart Immersion Blender that my husband bought me. It came with several attachments and the attachment I was most excited about was the mini grinder. You will need to keep a close eye on the nuts you are grinding. If you grind the walnuts too long, it will turn into nut butter! Add your favorite nuts to the grinder and grind until the nuts are ground up fine. If you grind too long you may end up with homemade nut butter so keep an eye on your walnuts as they grind. This grinder is really powerful. I purposefully left my walnut meal course so it would add texture to my cookies. I have no doubt that this grinder can make a super fine flour out of these walnuts if needed! All of the dry ingredients mixed together. You can tell from this photo that there is a lot of texture in these cookies. Here are the wet ingredients. When I bake with maple syrup, I really think Grade B natural maple syrup is the best. It is a little sweeter and has more minerals than Grade A. And now for the secret ingredient, chopped candied ginger. I love this stuff. You can add it to so many desserts like this Gluten Free White Chocolate Candied Ginger Biscotti or this Maple Ginger Butternut Squash Tart. Make sure to make these pieces of ginger small so the flavor can infuse into the cookies. If you are looking for a vegan version, check out these Vegan Dark Chocolate Walnut Bites by Healthy Seasonal Recipes. And now they are ready to enjoy with a glass of milk! In a small bowl, whisk wet ingredients. Grind walnuts into a coarse meal. Scoop batter onto a greased cookie sheet. Bake 8 minutes, or until cooked. 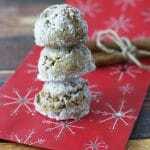 If you like this recipe, how about another great cookie with nutmeal? 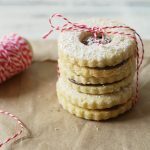 More Yummy Cookie Recipes to Try! Two things…. one, you’re right you can never have enough chocolate – and two… I would have never thought to do this on my own. What an amazing solution to enjoy a delicious gf dessert! Ok… three things, do you have any of those cookies leftover? 😀 They look delicious! LOL, I am so glad you like this. I agree you can never have enough chocolate! These look great! Thanks for linking up at our Gluten Free Fridays party! I have tweeted and pinned your entry to our Gluten Free Fridays board on Pinterest! 🙂 I can’t wait to see what you share this week! Its LIVE! Thanks Cindy. Have a great day. Love the addition of the candied ginger! I loved the grinder option for the immersion blender. I can’t grind nuts in my regular Vitamix so this grinder makes it much easier. I just want to sit at your counter and chat about food while snacking on these! They look great. Very clever idea for a cookie. Wow, these sound tasty!! I always get hungry when I read your recipes! Thank you Cindy 🙂 I am still in love with that muffin recipe you posted today. If I send you my address, will you send me some of these? I’ll send you a vegetable dish back in return! Thank you Shirley. My poor husband came running downstairs to see why I was jumping up and down and shrieking 🙂 I guess I have an odd happy dance.